Noise 5D, Virtual instrument for iPhone / iPod Touch / iPad from ROLI. Roli has released Noise 5D, a free iPhone app that uses the iPhone 6S's 3D Touch technology. 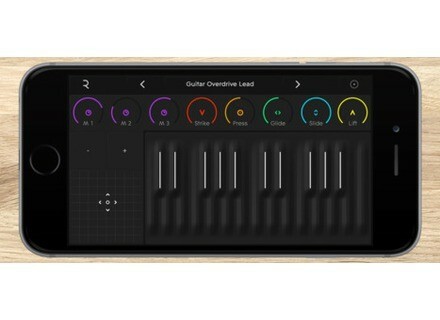 Announced as one of the first apps to enable Multidimensional Polyphonic Expression (MPE) through its MPE Mode, Roli's Noise 5D aims at delivering the expressiveness of acoustic instruments by giving users access to "the five dimensions of touch" through the interpretation of five parameters (namely Strike, Press, Glide, Slide and Lift) for sound-shaping. It features 25 on-screen keys, includes 25 sounds and offers five faders for fine-tuning the touch-responsiveness of the surface. While it works with all models of iPhone from the iPhone 5 to the iPhone 6s, Noise has been optimized to take full advantage of 3D Touch on the iPhone 6s. It is now available for music-makers of any skill level who want to explore a multidimensionally expressive instrument that fits in their pockets. Noise can also be used with the Seaboard Rise and other MIDI controllers. Powered by Equator and using MIDI over Bluetooth, it lets music-makers control sounds wirelessly from their iPhones and works with any MPE-compatible controller. The app’s 25 preset sounds – including Breath Flute and Extreme Loop Synth – were specifically designed for MPE expressivity, and additional sounds can be purchased in-app. Roli's Noise 5D is now available for free from the App Store, and more details are available from www.roli.com. Wavesfactory releases Newmello I Wavesfactory has released Newmello I, the first library in their new Newmello collection of mellotron-inspired libraries for Kontakt 4 and 5. Sonokinetic offers Cuica library for free Sonokinetic is definitely in a Brazilian mood these days as today's offer from their "12 Days of Christmas" is the Cuica library available for free. 73% off Brainworx's bx_digital V2 Today's X-Mas Calendar offer at Plugin Alliance is the bx_digital V2 mastering EQ for $89.